They Don’t Know is one of the weirder albums I own, in terms of the style of music I usually listen to. 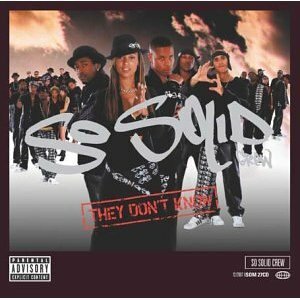 For those who don’t know – ha – which is probably everyone in America, So Solid Crew was one of the early garage superstar groups in the UK. It’s basically gangster rap over dance music. I have no earthly idea how I found out about them – maybe when I was in England after college, since that’s when this album came out. I remember digging up some songs on the Internet ( Haters and 21 Seconds) and I got addicted to their sound, despite popular rap not being the usual thing I gravitated toward. Ms Dynamite (called Lady Dynamite then) is a great rapper, and I was surprised at how much space they gave her to do her thing. I realized that I was confused by the cover – the woman featured prominently is actually Lisa Maffia, so I naturally assumed she was the one doing all the badass rapping. However, in doing research for this entry, I’ve figured out Lisa doesn’t rap a great deal on the album and was probably put so far in front as eye candy to sell albums. Yet another reason why I don’t usually gravitate towards this stuff – if Ms Dynamite was annoyed by this, she had good reason. Wow. This is going way back. 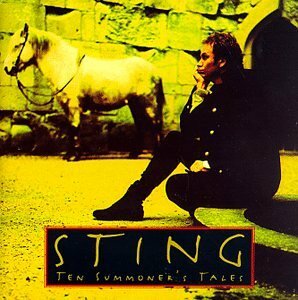 Ten Summoner’s Tales was one of the first CDs I ever owned. And as I owned few albums on cassette, it’s probably one of the first 20 albums I ever owned. I hadn’t listened to it in 15 years. A lot of the songs remind me of the early 90s because, frankly, they were everywhere at the time. I loved Fields of Gold back then. Listening to the album now, for what it is – vaguely jazz easy listening – it’s not horrible, but some songs are quite cheesy. It’s not really my style now. I do remember breaking this album out when I finally saw the director’s cut of The Professional – Shape of My Heart is used quite appropriately in the closing scene. Of all the songs, I enjoy it the most, simply because it reminds me of that brilliant film.